Can You Say (Sigh) Ahhhh? B elieve me. If you've ever had fresh, warm churros from a Mexican churrería, you want more. This churros recipe will let you indulge whenever the urge hits. They'll turn out almost as good as the ones at San Miguel de Allende's Café San Agustín. This recipe takes about 30 minutes to prepare and makes one good-sized plateful—enough for two people (unless you're greedy). Once you've got your equipment assembled, churros are surprisingly easy and quick to make. A little advance planning will streamline the process. You want to serve these lovelies warm, so don't try to make them ahead. They are just the treat for a special breakfast or brunch. And be sure to have some good Mexican hot chocolate on hand for dipping. 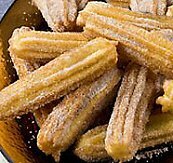 In traditional Spanish and Mexican kitchens, churros are made with a churrera, a special metal or plastic press with a plunger—much like a cookie press—that extrudes the dough into the hot oil. But you can do a perfectly nice job with a pastry bag with a large star-shaped tip. That tip will give your churros their traditional shape. For frying, you'll need a deep fryer or a heavy, deep pan. In the pan or deep-fryer, heat at least 2 inches of oil to 375 degrees F.
In a medium saucepan, heat the water and butter together until butter melts. Add the salt and 1 tablespoon of the sugar. Stir until dissolved. Bring mixture to a full boil. Mix in the flour, stirring vigorously to blend well. Continue mixing until mixture forms a doughy ball, about one minute. Remove from heat after about 30 seconds or the churros will not puff properly. Add eggs one at a time, mixing well after each addition. Continue mixing until all the egg is completely incorporated and the dough is glossy. Set aside to cool and rest for about 5 minutes. Mix remaining sugar and cinnamon in a shallow dish and set aside. Test the temperature of your frying oil. Drop a small ball of the dough into the hot oil. It should bubble up to the surface immediately. If is doesn't, the oil is not hot enough and you'll end up with soggy, greasy churros. Want to make your Churros and other Mexican dishes and desserts even more authentic? Spoon the dough mixture into a cake decorators' piping tube with the largest star tip available. Rolling down from the top, squeeze 4-inch strips of dough into the hot oil. Don't crowd the churros. 3 or 4 at a time is about right. Fry 3-4 minutes, turning once, until golden brown. Remove from the oil with a slotted spoon and set onto paper towels to drain. Roll churros in cinnamon/sugar mixture and serve warm. Keep a napkin handy for wiping the sugar off your chin. Don't even try to wipe the smile off your face. This churros recipe will make you think you've tasted heaven.